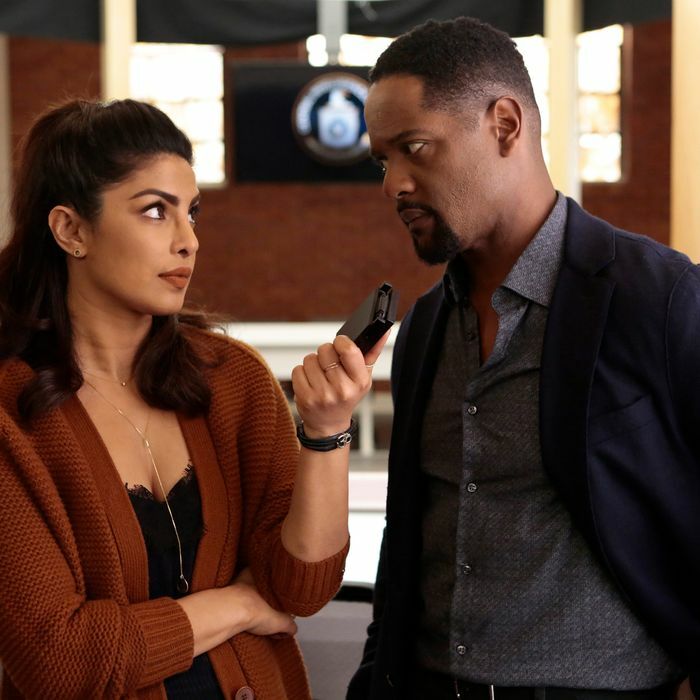 Priyanka Chopra as Alex, Blair Underwood as Owen. When in danger, the best protection is a strong alliance. To be able to willingly enter a dangerous situation, you have to trust that your backup will stand guard, that your team will come to save you, that — no matter how it feels — you are never alone. No one knows this better than Alex Parrish, because she is almost always in trouble. No matter how self-assured and fit she seems to be, there is always another corner to turn, always another enemy to defeat, and always another teammate right on the verge of abandoning her. In last week’s episode, Quantico set up a complicated narrative that reminded us it’s almost impossible to remember which characters are on which team. So many of them are double agents, it would take one of those CIA wall maps covered in string to keep everything straight. It all seemed like an unnecessary reminder: We get it, the show is confusing. But in this week’s episode, “Zrtorch,” that blurry message is reduced to its core. When a gun is held to your head, who will you be willing to protect? With that essential question in place, all of the show’s revolving-door relationships actually work. This week’s episode deals in pairings, couples forced together for better or worse, romantic or not. Unlike the scenes that involve teams of people running around, in these twosomes, several characters achieve new depth, and in that depth they are able to create some drama that doesn’t depend entirely on plot twists. That’s not to say that there aren’t some surprises this episode — it wouldn’t be Quantico without at least two shocking reveals. But this time, the reveals take a back seat to the character drama in the foreground. This week’s theme is all about “protecting your asset.” In the past, the team learns a lesson about “extraction,” and how to remove an asset who has been placed in a dangerous situation. The asset is Owen Hall (Blair Underwood), the director of “The Farm,” who’s been intentionally placed in harm’s way in Germany. The mission: The agents have to stage a successful extraction before German foreign intelligence catch him. But the lesson of this episode isn’t about how extraction works. It’s about allegiances. During this mission, the agents begin to choose teams. Léon Velez (Aarón Díaz) chooses to saddle up with Dayana Mampasi (Pearl Thusi), despite their rocky past. Ryan chooses to pair up with Alex, who, when given the opportunity to abandon her in danger, chooses not to. Alex pairs up with Owen, who, she protects from a disgruntled young man from his past. Surprisingly, the most effective pairing is between Harry Doyle (Russell Tovey) and Sebastian Chen (David Lim). The two have had a fairly unbelievable comradery: In the past few episodes, Harry encouraged Sebastian to betray his morals and sleep with a woman for a mission, and later, Sebastian kissed Harry. Sebastian has been an untouchable character, highly religious but not given a lot of space to talk about his beliefs. Because of that, Harry believes he is just a poser, regurgitating the lines he’s been spoon-fed. But in this episode, the two have a heart-to-hear over beer, and Harry is forced to recognize that Sebastian believes him a source of evil in the world, and that their relationship isn’t based on mutual respect at all. The chemistry between the two actors works beautifully, and seeing Harry realize he is hated for being himself is one of the most effective emotional punches the show has thrown in a long time. Where the episode struggles, however, is in its sense of danger. All spy shows require an imminent danger to keep them entertaining: It keeps blood pressure high and viewers interested. Unlike other female-led spy shows (Alias, for example), Alex Parrish is too perfect to truly fear for her safety. We know theoretically that Alex is in danger, but she’s never proven herself to be anything but capable under pressure. Her incredible ability to get herself out of any sticky situation has become a road bump in her character’s story. It no longer feels like Alex is in danger, even when she is. On top of that, we know Alex is not truly in danger because we’ve seen her alive and well in the present-day story line. It’s impossible for Alex to be both killed or severely injured in the past, so even when she is Tased in a hallway midway through this episode, it’s far too clear that she’ll be fine. There’s even a moment when Shelby Wyatt (Johanna Braddy) jokes to Alex that she has to leave before “you get me killed … literally.” It’s that lightness, that joking, that pervades Alex’s truly dangerous situations and makes them seem flippant. This is true for both the past and the present of this episode. The tension over character deaths just doesn’t work because it’s not believable. Quantico hasn’t killed off a main character since the season-one finale, and it’s easy to forget that the show can. In the present-day timeline, Ryan Booth (Jake McLaughlin), Léon, Dayana, Sebastian, and Harry find themselves trapped in the terrorist block. At one point, a gun is actually held up to Ryan’s chest during a struggle with a terrorist. But nevertheless, it simply doesn’t feel like a serious threat. The terrorist situation occupies a small amount of screen time, and it’s a good thing because the tension is fading fast. Will Olsen (Jay Armstrong Johnson), the brilliant nerdy hacker from season one, returns to provide a much-needed dramatic lift, but even that is not enough. Though the terrorists shoot a man in front of the captives, and Will provides some preachy commentary about the rogue CIA functioning like ISIS, the drama is gone, and Quantico seems to know it. At the end of the episode, Alex, Ryan, and Will free the captives from the terrorists’ hold. Let’s hope finally closing that story will be just what this show needs: a bit of a fresh start.